We always have the option of being pessimists, optimists – or a mixture of both – when contemplating the state of our small personal lives and/or the bigger picture of world affairs. Despite an entirely understandable level of collective pessimism in response to current geo-political turbulence and upheaval of an extraordinary nature, I think there is nevertheless room for a reasonable degree of optimism as we survey the future, from whichever lens or range of lenses we choose to view Earthly and planetary affairs. As an astrologer I have been fascinated and awed by what the behaviour of just one planetary pair, the combination of Jupiter and Uranus, has revealed at a symbolic level in casting light on the patterns and rhythms of both ordinary and deeper time. It is in our nature as human creatures to be forever moving forward in restless pursuit of knowledge. The historical behaviour of the Jupiter/Uranus cycle describes this well in symbolic terms. Short of being knocked off our orbit into annihilation by a large chunk of lethal inter-planetary rock (always a possibility,we have been discovering, as astronomical knowledge advances! ), we will carry on moving forward in terms of the expansion of knowledge, one way or another. Because we continue emotionally to be tribal carnivores, it is very unlikely that we will ever stop internecine struggles for dominance: so – ongoing warfare to a greater or lesser extent seems inevitable. Because we are imaginative, and appear as a species to be “wired for God”, it is unlikely that we will ever stop annexing whatever Deity our particular tribe favours, as an excuse for attempting to eliminate the opposition whose Deity is perceived as being inferior. Whether the Ultimate Truth our particular tribe perceives is religious, scientific or political (worst case scenario, all three!) doesn’t really appear from the evidence of history to matter much, in terms of outcome. We stagger on, and will – probably– continue to do so. However, on the very positive side, we seem to be returning at a number of levels to a profound and world-wide awareness that all life is inter-connected, that we are all ultimately dependent on one another and on our Mother Earth for survival. As the ancient astrologers put it : “As above, so below”. Resources are running out, especially fossil fuels. We must find new ways of surviving on our planet. Hopefully that will – through what looks like increasingly turbulent times in the immediate future – lead to greater co-operation, inspired by an increasing recognition that, in Chief Seattle’s oft-quoted words, “What we do to the earth, we do to ourselves”. 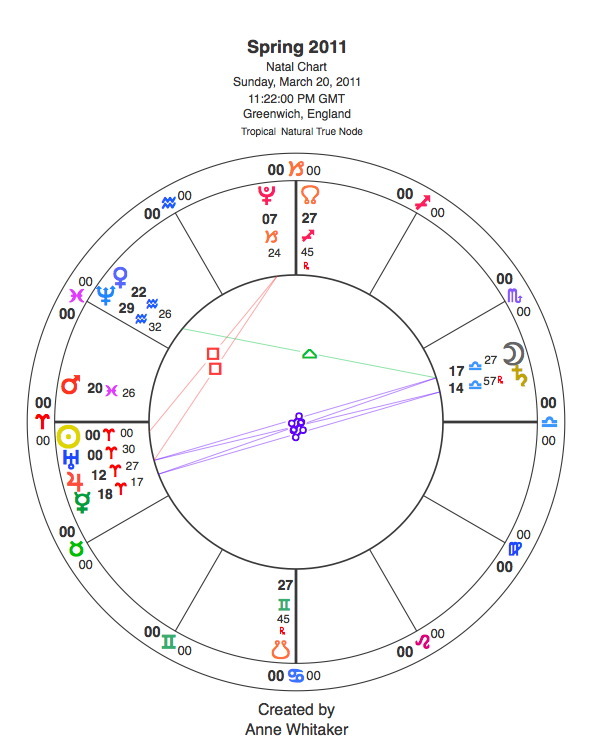 Perhaps this is the unfolding future to which that dynamic and innovative Jupiter/Uranus planetary duo is pointing….